OK, I know we have talked about Fall but it is officially now Fall according to the weather man. Since we seem to rush the calendar, are you ready for Christmas? It is so hard to imagine that we are already at the end of September but, when we have welcomed back a few "Snow Birds," I will know it is true. Winter is almost here. A big thank you to Kathy R. who brought the neatest sign in as a gift..."Death by Candy Corn." What a way to go? It is by the register for all of you to enjoy, I sure am. Thank you, Kathy. Monday, Margy spent the day with beginner fusible applique students. They all did a great job and she has new converts! Hard to believe you all aren't followers of the Glue Queen. We do appreciate the beauty of hand applique but... we would never get it done. She has another beginner class on Monday, October 18th. This time they will be completing "Reindeer Magic" Yes, that is correct there will be tops completed at the end of the class. Look below for a picture of the class and then stop by and take a look and she will be happy to answer any questions. For those who have accepted the fusible challenge; Margy will be hosting 'Beach Walk" assistance during scheduled sessions twice a month. The first session is Wednesday, Sept 29th, 12:30 - 4. This class is free to anyone who has purchased the complete "Beach Walk" kit from us. We will collect a $10 fee from anyone who has not. The fusible work is complete on the store sample, now the stitching begins. Come take a look at the progress. McKenna Ryan has outdone herself with this quilt design. It is so US! Don't forget Saturday is FLASH day for Saturday Sampler; the demo is at 9:30. Just a few helpful hints to share. It will be repeated on Monday at 1pm for those who are not able to attend this weekend. We are nearing the end and everyone is doing such a good job. Next Tuesday Joey is teaching you how to stuff pumpkins; she has converted a wool project to cottons and will share her tips of hand embroidery of the details. It will be a fun class with finished projects. 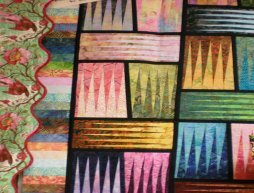 On Tuesday, Oct 5th Joey will again teach "The Bling Thing"; this has been a very effective and requested quilt class. Again the tips are invaluable. You can't believe how big a quilt you can get from a jelly roll, and about 21/2 more yards of fabric. It is a great difficult looking but easy quilt. Learn an easy way to make diamonds. Natalie Carlton has agreed to share her "Faces" techniques with all of us during a class on Tuesday, Oct. 12th. 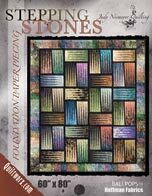 "Stepping Stones" is on the calendar Thursday, Oct 14th with Kathy Rentz. Many of you have asked when??? well here it s. We have cut 100 strips that make this batik quilt a snap and that is what the store sample is done with the 100 pack of strips. "Step in to Christmas" is scheduled for Saturday, Oct 23rd with Karen Demos. 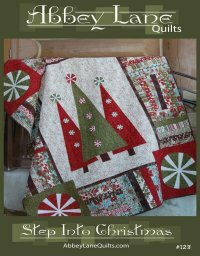 Get going on this quilt top and you have one gift done for the holidays! The holiday fabrics in our Sample room continue to be $5.50 per yard this week. New items have been added.Our book collection is 40% off through Saturday. We are adding the Children's wall of fabric and the Bright's display of fabrics to our rotation of $5.00 a yard sale fabrics. Hur in before the good ones are gone. This is a great time to get backs for those tops that are done. Also, a good time to pick up quilt-shop quality fabric for raffle quilts and charity quilts. Hope to see you soon and have a great week. Some of us will be at the Quilt Show in Jacksonville and will be full of info on Monday, stop by to hear all the news.